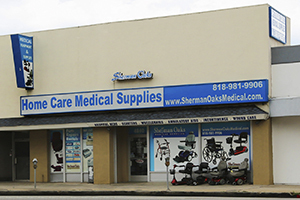 Sherman Oaks Medical Supplies will guide you through the entire process of obtaining a Power Wheelchair or Mobility Device through your insurance. Based on your insurance guidelines, we may be responsible for delivery, setup, and training of equipment, therefore we can NOT provide service for insurance beneficiaries that live outside of our service area. What DME items can you get from Sherman Oaks Medical Supplies through Medicare? Medicare will also pay for the repairs of items paid by Medicare within the last 5 years. We have a fully equipped repair shop and trained technicians. 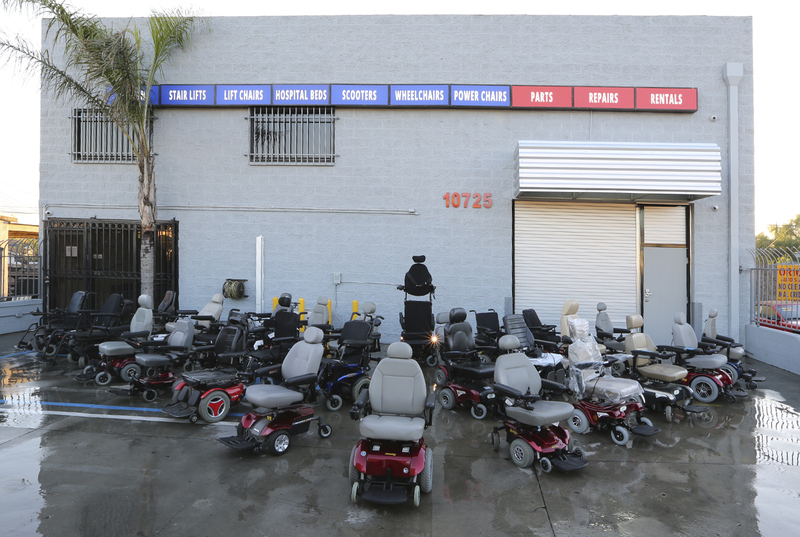 We are specialized in repairs of rehab mobility equipment. Give our repair center a call to inquire if your repairs will be covered by Medicare. The phone number there is (818) 896-9996. Do I need to pay out of pocket for items covered by Medicare? Medicare pays 80% of the cost and the remaining 20% is paid by supplemental/secondary insurance. If you do not have supplemental/secondary insurance, the 20% is your responsibility. How do I choose the right rehab equipment? Rehab equipment is usually ordered by your MD and Physical or Occupational Therapists. We have a RESNA certified ATP's (Assistive Technology Professionals) and Certified Rehab Technicians who will take their time to evaluate and demonstrate the functionality and compare your rehab equipment choices, as well as will fit you for the proper rehab mobility equipment. We work closely with manufacturer representatives and involve them if needed in the assessment and selection of the rehab equipment. We do in home assessment as well as in home delivery and setup for all the major items such as power chairs, ultra-light wheelchairs, patient lifts, etc. We provide patient and caregiver training on the delivery. What are Medicare requirement for coverage of my rehab mobility equipment and other DME services? Medicare requires your doctor to document the medical necessity for the ordered rehab equipment in a face to face evaluation and ruling out of the less costly equipment. Medicare will also require a physical or occupational therapist to evaluate your mobility needs and provide medical justification for the items ordered. Most custom rehab power and manual wheelchairs, as well as positioning accessories and specialty cushions also require certain diagnosis to be covered by Medicare. Some of the diagnosis meeting coverage criteria are listed below. California State Medical, and medical HMOs including LA Care, Gold Coast, Health Net, Medical Blue Cross, Tricare. We are also contracted with major private PPO insurances including Blue Cross, Blue Shield, LA Care, Health Net. If we are not contracted with your private insurance, such as United Healthcare, Cigna, Aetna, we can still provide you services and bill your insurance as an out of network provide if your insurance has "Out of Network coverage". What are the items we provide through Medical and private insurances? *Call us to get a full list of DME equipment you can get from us through your insurance. How much of the total cost is covered by my insurance? If medical or medical HMO is your primary insurance it will usually cover 100% of the cost. If you have a share of cost with your primary medical insurance, you will be responsible for the share of cost portion. Most items will require prior authorization from your insurance to be covered. An MD order and other medical documentation supporting medical necessity are needed to get an authorization. If you have a private insurance, you will be responsible for the deductible and copay based on your policy. Depending on the items selected you may also be required to pay upgrade fees. Some items will require prior authorization from your insurance to be covered. An MD order and other medical documentation supporting medical necessity are needed to get an authorization. We have trained personnel, certified rehab technicians, and RESNA certified ATP's (Assistive Technology Professionals) who will take their time to demonstrate the functionality and put side by side all the available equipment, as well as be involved in fitting for the rehab equipment. We work closely with manufacturer representatives and involve them if needed in the assessment and selection of the rehab equipment. We do in home assessment as well as in home delivery and setup for all the major items such as power chairs, hospital beds, patient lifts, etc. We provide patient as well as caregiver training on the delivery.